Gender inequality is costing sub-Saharan Africa on average $US95 billion a year, peaking at US$105 billion in 2014– or six percent of the region’s GDP – jeopardising the continent’s efforts for inclusive human development and economic growth, according to the Africa Human Development Report 2016. 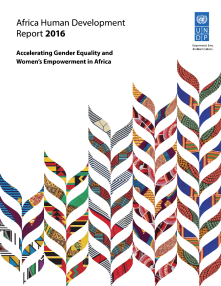 The report analyses the political, economic and social drivers that hamper African women’s advancement and proposes policies and concrete actions to close the gender gap. These include addressing the contradiction between legal provisions and practice in gender laws; breaking down harmful social norms and transforming discriminatory institutional settings; and securing women’s economic, social and political participation. The Caribbean HDR titled “Multidimensional Progress: human resilience beyond income” highlights the need to rethink the methods for ranking development in the region’s countries that go beyond per capita income, economic growth rates and Gross Domestic Product (GDP). The Caribbean HDR calls on governments, the private sector and all of society to rethink the region’s progress along multidimensional lines, inspired by the 2030 Agenda for Sustainable Development, including the Sustainable Development Goals (SDGs): nothing that reduces the rights of people and communities or threatens environmental sustainability can be considered progress, the report highlights. 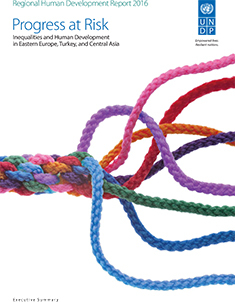 This report explains how—despite relatively equal distributions of income, broad access to social services, and small gender disparities—many countries of this region are facing growing threats to their human development accomplishments. It shows how popular concerns about inequalities—in terms of income and wealth, but also equality before the law — seem to be on the rise in many countries. It identifies key policy reforms and programming areas for more effective responses to the region’s inequality challenges. Both theoretical foundations and empirical analysis demonstrate a direct but more intricate relationship between industrialization and human development. Human development is defined as the process of expanding individual freedoms to live long, healthy and creative lives; to advance towards other goals that they have reason to value; and to engage actively in shaping equitable and sustainable development on a shared planet. Fundamental to enlarging peoples' choices is the building of human capacities – the range of things that people can do or be in life. Investing in people will enable growth and empower people, thus developing human capacities. Employment, either through self-employment or wage employment, is the primary means through which individual capabilities are used to earn income. This income can then be diversified into productive assets, including human capital. When average incomes increase, overall consumption increases, savings accelerate and investments in technological advancement, physical assets, education, and skills also expand. An analysis of the priorities of the poor in Zambia reveals that, beyond income, individuals value a broad range of things. They require adequate food and nutrition, safe and accessible water supply, better medical services, good quality education at all levels, affordable transport services, adequate shelter, secure livelihoods and productive and satisfying jobs (Republic of Zambia, 2002; UNDP, 1996).